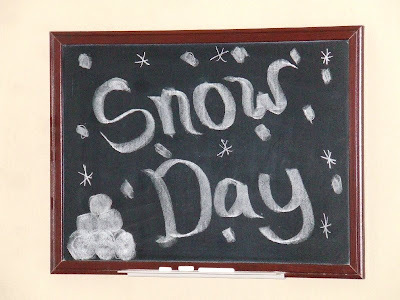 Husband is off for the rest of the week because he won't be off next week :( so we are declaring today a Snow Day. Real snow days do occur naturally here in Texas but we can't count on one every year so we are making our own. On the agenda: 1. 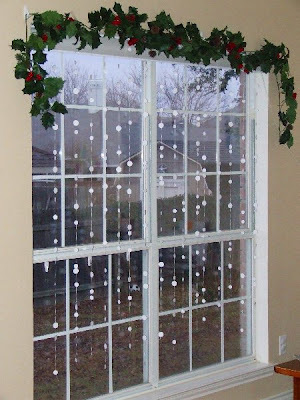 Create our own snow storm in the windows. I made this one last night so the kids will get to work on their bedroom windows today. Warning: This project is so addictive you will find yourself looking at every window in your house and wondering if there are any 24 hour office supply stores. There aren't, just to let you know, but Wal-mart carries the 3/4 inch round labels and they are open 24 hours. I'm just sayin'. 2. We were so delighted by Joann's pictures and the simplicity of this project that we made our own last night so that they would be ready for Snow Day today. Some of us experimented with metallic pipe cleaners. 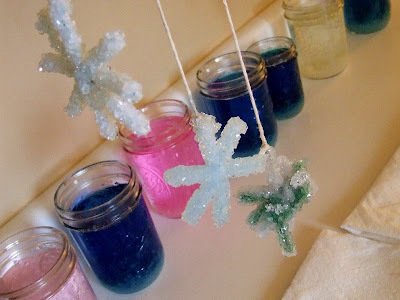 The pink and red ones changed the color of the Borax solution but not the green or silver. Hmmmm? 3. Some sort of snow snack. I am thinking maybe Sugar Snow made with shaved ice or Snowman Meringues or maybe just Marshmallow Men. Suggestions welcome! 4. A snowball fight for sure! The giant basket of white socks sitting in my bedroom will do nicely and no, I'm not posting a picture of those! 5. Some serious snuggle time under piles of blankets with good books and hot chocolate all around. Isn't that all you people north of the Red River do this time of year? Enjoy your special time with your husband! Mine had an "inclement weather day" yesterday and it was fantastic. I am sure your snow days will be very memorable for your children. Sounds like fun! "Some serious snuggle time under piles of blankets with good books and hot chocolate all around. Isn't that all you people north of the Red River do this time of year?" To Paula in MN: Snow from October to May?! No wonder winter Texans stay down here so long! Charlotte: What a beautiful bout of family togetherness. I think I might try to do this with our family when my husband gets his vacation. Charlotte, you won't believe what we made today...."A Snowstorm in the Window". I had been planning it for today, and when I read your post, and you had already done it I had to start laughing. I think we must be the same woman in different families in different parts of the country. (By the way, my part of the country also has snow from October to May--last year we had a snowstorm on First Communion day-the same day as Mother's day--in May! What a cool idea, Charlotte! A wonderful, fun idea! Y'all are going to have to put your imaginations in overdrive, as we will this weekend. I just saw a forecast predicting 76 on Friday. What's up with that? Paula in MN: seriously envying your cold weather... I grew up in St. Paul. What a great idea! Yes, 76 tomorrow but then in typical Texas fashion...22 overnight on Sunday! :) What's that about??? This is fabulous,Charlotte! What fortunate children you have! Sending snowy Colorado thoughts your way ~ Hope you all have a wonderful week with Dad. I love your snowstorm window! What a wonderful idea! Just might put that on our craft list if we don't get somew fresh snow soon!